SUNTRUST’S TOP SELLING TEAM, Falcons Division, is looking for awesome PROPERTY SPECIALISTS and BRANCH SALES MANAGERS!? 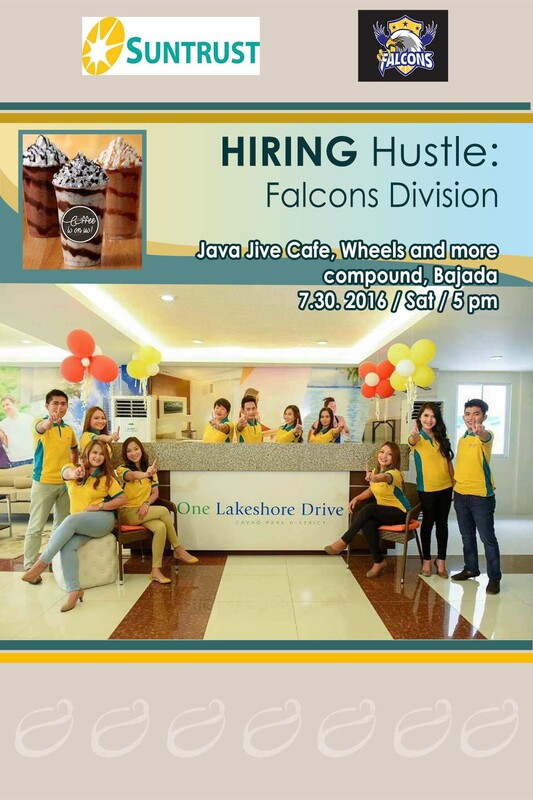 If you are up for the challenge, EMAIL your CV/ Resume with contact information to hiringhustle.falcons@gmail.com and WAIT FOR THE TEXT CONFIRMATION, and come to our Hiring Hustle coffee and cocktails event. Instead of a bland, office arrangement, the HIRING HUSTLE event will have a more relaxed atmosphere where you can meet your future teammates, get to know the company, and feel an overall good vibe about working with a similar set of highly motivated professionals. So don’t forget to email your CV/Resume to hiringhustle.falcons@gmail.com. You will be sent an SMS for your confirmation and coffee meeting schedule. Walk-ins are also welcome but their schedule will be determined on the day of the event. (Wheels and More Compound, JP Laurel, Davao city). ✔️SHARE AND TAG your friends who might like this. COFFEE is on us! ❤See you! ?For inquiries, contact Jessa at 0942 0888 702.